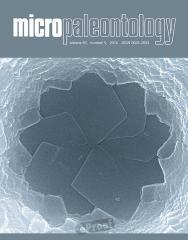 ABSTRACT: A new foraminiferal species, Bulbobaculites gorlicensis n. sp., is described from the Bartonian (Middle Eocene) succession of the Hieroglyphic beds deposited in the Silesian Basin, Outer Carpathians (South Poland). It occurs in association with deep-marine bathyal and abyssal assemblages dominated by agglutinated forms. The test of Bulbobaculites gorlicensis is relatively large, free, and elongated, consisting of 3-4 spherical chambers quickly increasing in size and composed of coarse quartz sand grains. The initial part of the test is in low trochospiral coil, terminally uniserial with terminal aperture on the last, largest chamber.